Researchers at UBC’s Okanagan campus suggest municipalities should put a greater emphasis on green initiatives to reduce heavy rainfall flooding urban areas. The recently published study looks at population growth and the effect urbanization has on infrastructure, especially when it comes to pluvial flooding. 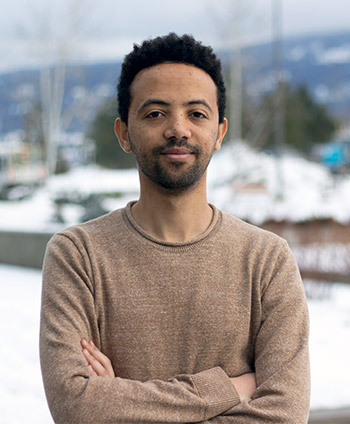 UBC Okanagan Engineering student Yekenalem Abebe. Pluvial flooding occurs when an urban drainage system has trouble funnelling intense amounts of rainfall, says Yekenalem Abebe a PhD student in the School of Engineering and study lead author. The study reports that urbanization changes a city’s land cover; more buildings, roads and other development means fewer porous areas made up of trees, grass and natural greenspaces. Instead of being absorbed by these natural areas, rainfall ends up in a city’s drainage system. When there is a heavy rainfall, the infrastructure can’t keep up. The costs of flooding from extreme rainfall events have been pegged at more than $13-billion in Canada. Drainage infrastructure capacity, type and condition are factors that influence the occurrence of pluvial floods, explains Abebe. Infrastructure has to be in good condition and perform according to its design requirements to prevent pluvial flooding. Therefore, not only does design capacity have to be considered in flood vulnerability assessment, but so does the current condition and performance of storm drains. Currently, more than 80 per cent of Canada’s population lives in cities and that number is expected to increase sustainably in the next 50 years. That growth requires new infrastructure development and Abebe is recommending that builders limit flood risk by considering materials and approaches that mirror or aid natural defences. “By promoting green development like green roof constructions and encouraging the use of porous pavement materials, urban planners can reduce the vulnerability of neighbourhoods currently at risk,” says Abebe. Abebe used data collected by the City of Toronto and was able to diagnose the main factors that influence basement flooding and predict the Flood Vulnerability Index of an area. Abebe says the Toronto case study clearly illustrates that risk mitigation and adaptation planning is essential in urban areas. While the research uses data from Ontario, Abebe says the Flood Vulnerability Index can be used in any municipality regardless of size or location. The research, recently published in Journal of Cleaner Production, was supervised by School of Engineering Professor Solomon Tesfamariam and received financial support through MITACS and the Natural Sciences and Engineering Research Council of Canada.